I had yet to do any, what I’d call, “serious” photography on our trip to Japan. 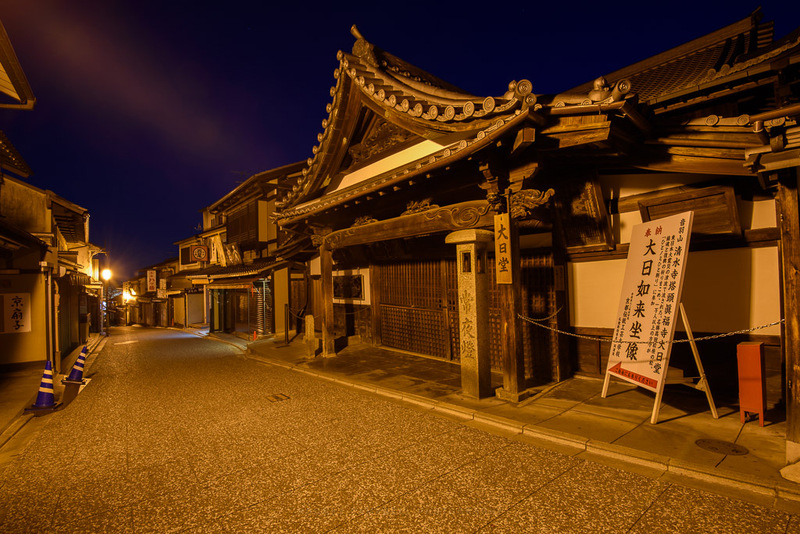 I’d decided I’d get up early and go a wandering the streets of Kyoto before dawn. It all sounds like I had no real plan at all; that I’d just be wandering the streets aimlessly hoping for inspiration. I actually had a very specific plan in mind. My intention was to go visit the epic Kiyomizudera Temple well before the sun rose so I’d get the place hopefully to myself and get the best light. So I woke very early and made my way up the street (significantly less crowded than yesterday when it was absolutely jam packed with visitors). I arrived at the temple at just after 4AM (still well over an hour till sunrise). Alas I had not planned for the temple to be closed and cordoned off and very helpful guards telling me I’d have to come back when it opened at 6AM. Very disappointed I headed back down the street to go wandering in the streets of Kyoto looking for as they say inspiration. 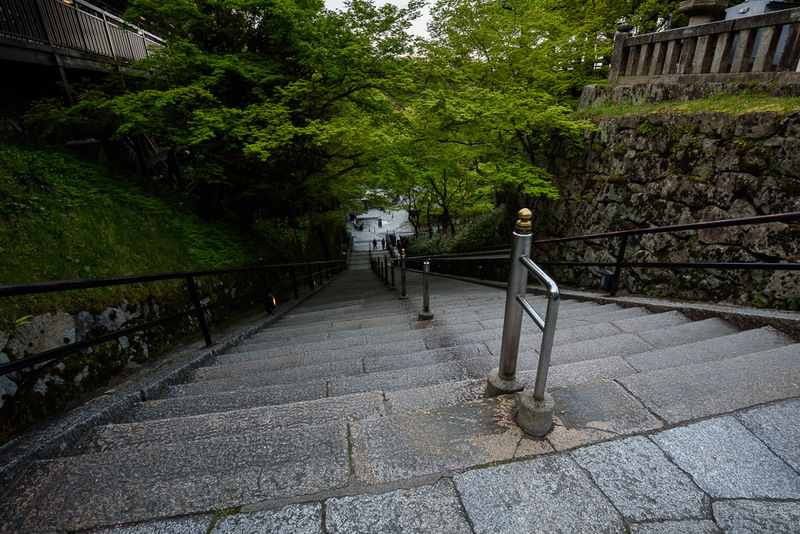 Part of the fun of visiting Kiyomizudera is the approach to the temple along the steep and busy lanes of the atmospheric Higashiyama District. The many shops and restaurants in the area have been catering to tourists and pilgrims for centuries, and products on sale range from local specialties such as Kiyomizu-yaki pottery, sweets and pickles to the standard set of souvenirs. During the day this area is absolutely packed and bustling with activity. Right at the edge of twilight it has a very different feel. 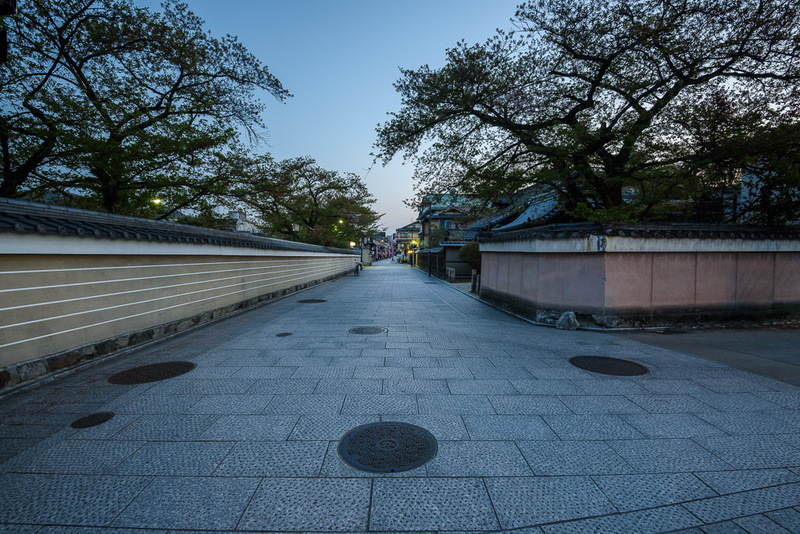 I made my way all the way towards Gion by the time the sky was getting lighter with the first hints of sunrise. The streets were still essentially empty as you can see in the image here. Eventually my wanderings took me back to Kiyomizudera for the 6AM opening. A couple of other brave tourists also arrived in time for the opening. The majority of the twenty or so people there at 6AM were locals for whom this temple is their local place of worship. I spoke with a few very nice old locals whilst we waited and then we were allowed inside. It was amazing to have this whole place essentially to oneself for a while. A completely different feel to during the day when the place is overrun by visitors. At 6AM it is calm and serene, one would say spiritual – as it should be. 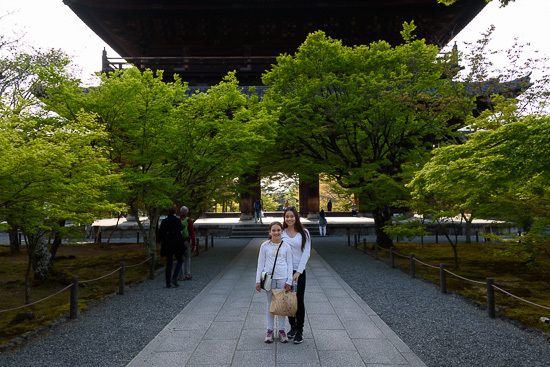 Nanzenji Temple (南禅寺), whose spacious grounds are located at the base of Kyoto’s forested Higashiyama mountains, is one of the most important Zen temples in all of Japan. The history of Nanzenji dates back to the mid 13th century, when the Emperor Kameyama built his retirement villa at the temple’s present location and later converted it into a Zen temple. 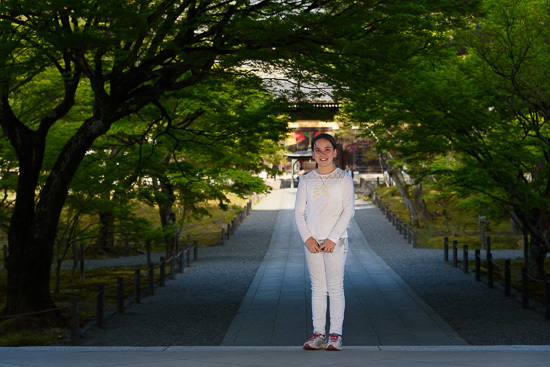 Visitors will first come across Nanzenji’s massive Sanmon entrance gate, which extends over the treetops. The gate was constructed in 1628 by the ruling Tokugawa clan for soldiers who died in the siege of Osaka Castle in 1615. It was underneath the massive opening of the gate that I was getting this amazing glowing reflected light off the stones. I placed my daughters in the light with the arch of trees going into the distance. This allowed for some quick natural light portraits. 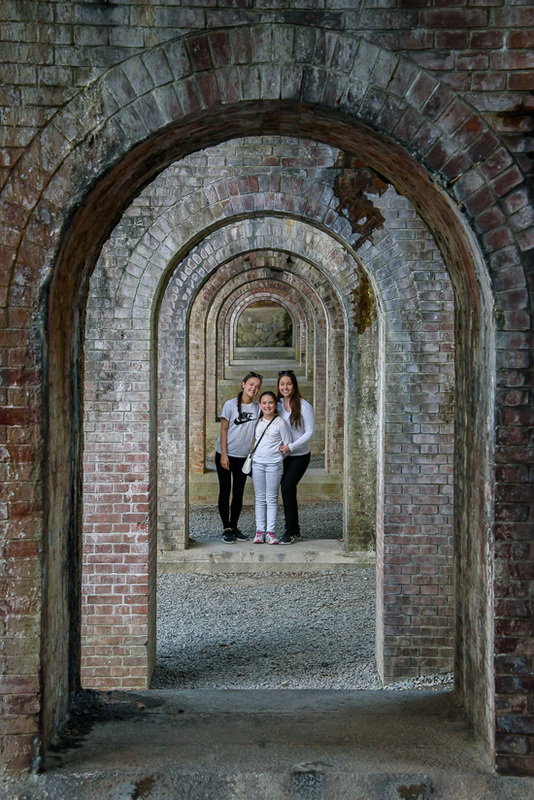 Further along you will come across a rather odd sight: a large brick aqueduct that passes through the temple grounds. 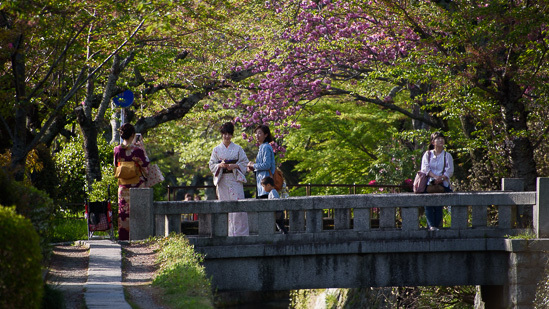 Built during the Meiji Period (1868-1912), the aqueduct is part of a canal system that was constructed to carry water and goods between Kyoto and Lake Biwa in neighbouring Shiga Prefecture. Paths run alongside the canal that lead into the surrounding forest. We followed the Okazaki Canal through the forest to the Keage Incline. It was originally built during the early Meiji Period to connect the lower elevation waterways of Kyoto city to a higher elevation canal that runs all the way to Lake Biwa. The Keage Incline, which utilized a rail system to transport the small cargo boats up and down the slope, is lined by dozens of cherry trees, and the area has become an extremely popular sakura spot for the beautiful combination of the abandoned rails and cherry blossoms. The blossoms were almost gone by the day we were there. We headed to a nearby subway station and made our way back to town. Time for dinner and then home to bed. 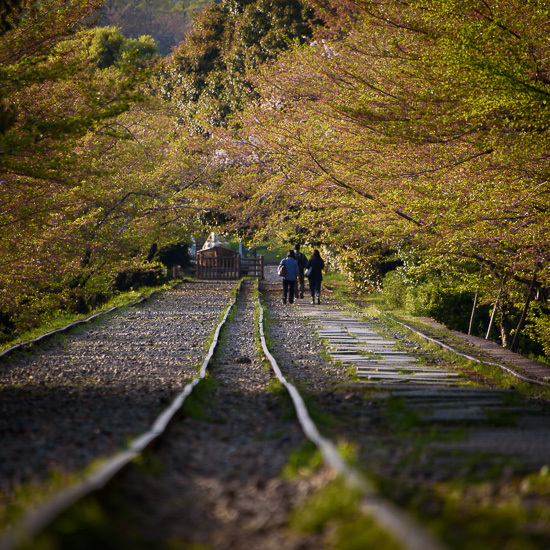 The Philosopher’s Path is the best walk in Kyoto. 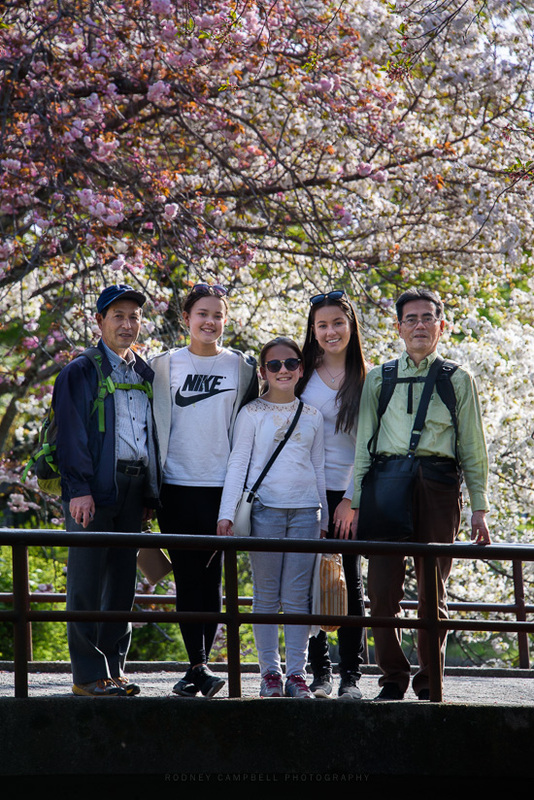 It’s a 2 kilometer stone path along a sakura (cherry tree) lined canal (30 minute walk) that winds past charming shops, cafes and traditional houses. 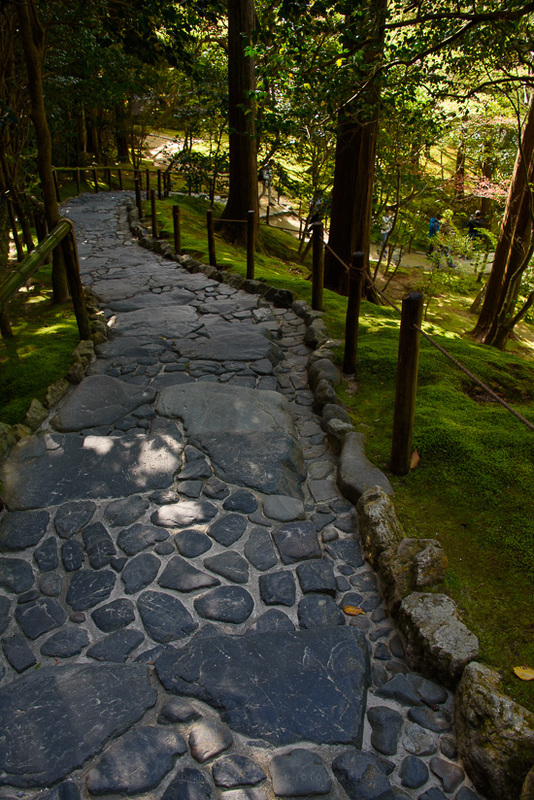 The Path of Philosophy starts about 100 meters north of Eikan-do Temple and reaches its northern terminus at the base of the approach to Ginkaku-ji temple (Silver Pavilion). We walked it in reverse starting at the Silver Pavilion end and wandered slowly along the path to the southern end. The path gets its name due to Nishida Kitaro, one of Japan’s most famous philosophers, who was said to practice meditation while walking this route on his daily commute to Kyoto University. 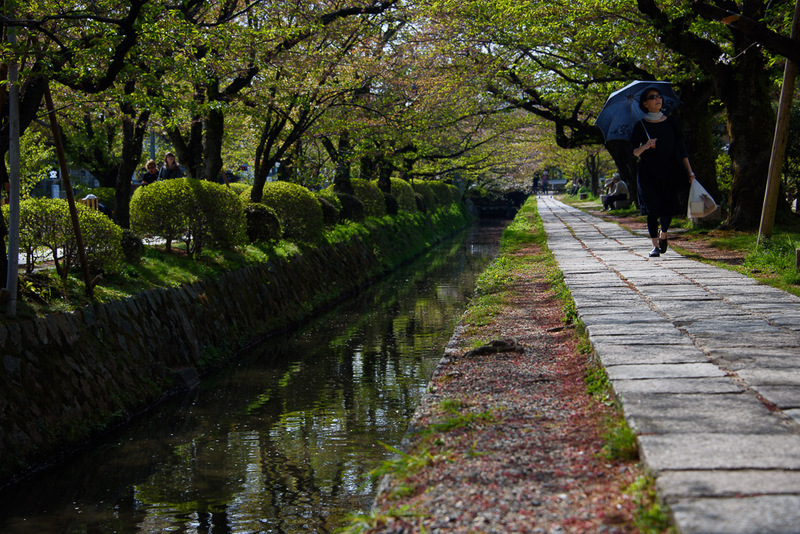 The path follows a canal which is lined by hundreds of cherry trees. 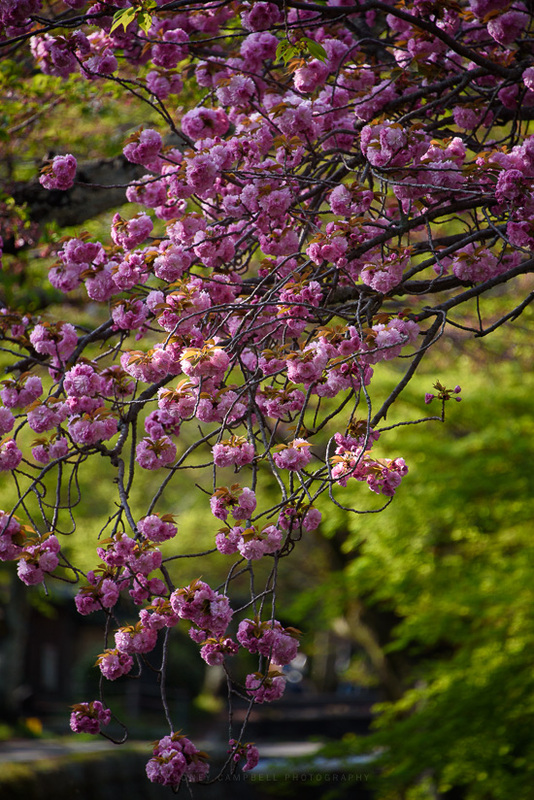 Usually in early April these trees explode with colour, making this one of the city’s most popular hanami (cherry blossom viewing) spots. Unfortunately we missed the best of the blossoms by perhaps a week, still what remained was very beautiful. It was a lovely day to be out walking and we joined the many other families enjoying the walk. Many were dressed in traditional kimono which only adds to the charm. 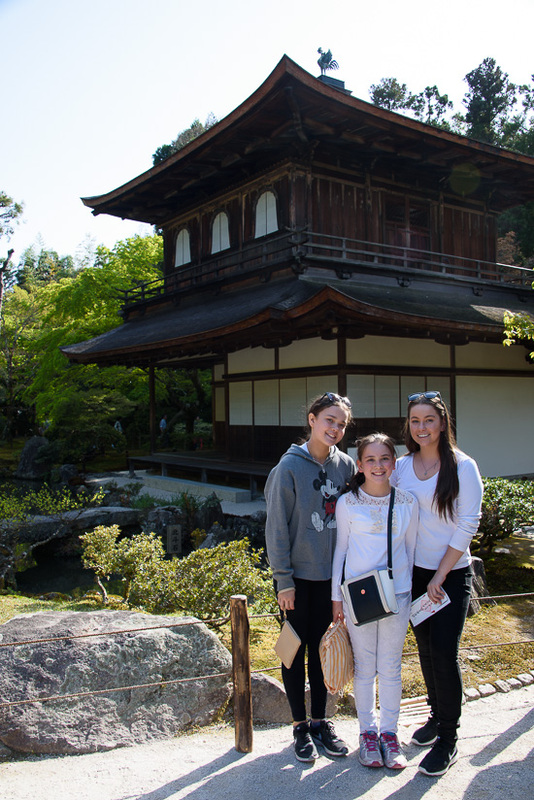 Ginkakuji (銀閣寺, Silver Pavilion) is a Zen temple along Kyoto’s eastern mountains (Higashiyama). In 1482, shogun Ashikaga Yoshimasa built his retirement villa on the grounds of today’s temple, modeling it after Kinkakuji (The Golden Pavilion), his grandfather’s retirement villa at the base of Kyoto’s northern mountains (Kitayama). The villa was converted into a Zen temple after Yoshimasa’s death in 1490. Despite its name, the Silver Pavilion was never covered in silver. Instead, it is believed that the name arose as a nickname more than a century after the building’s construction to contrast it with the Golden Pavilion. 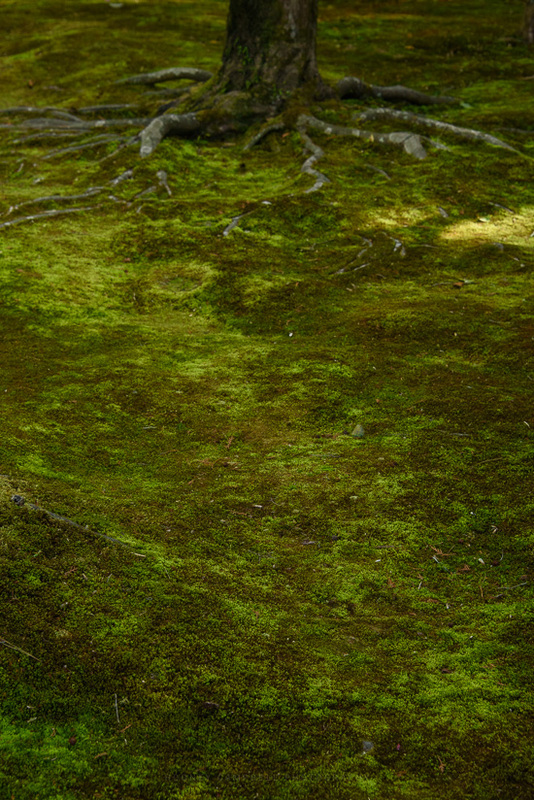 The moss garden is especially beautiful, almost serene – even with the crowds of tourists. The palette of smooth greens was offset nicely by many women garbed in traditional dress. 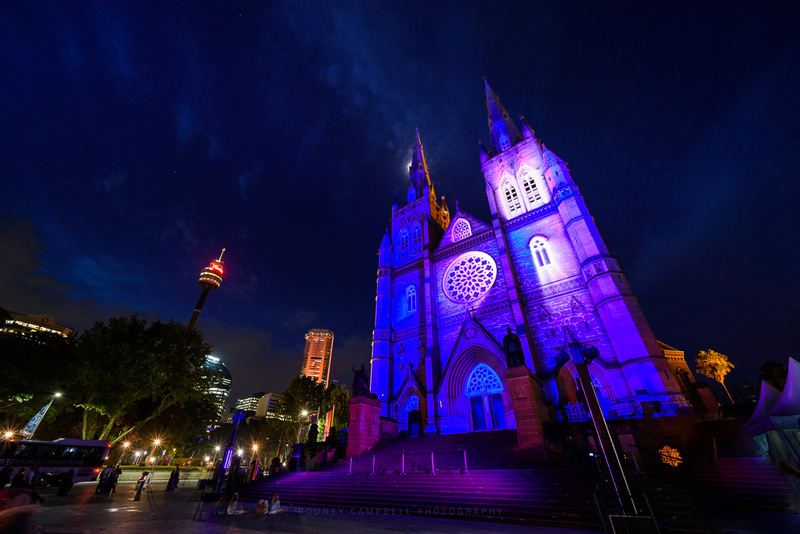 I was once again at St Mary’s Cathedral for the annual Lights of Christmas. 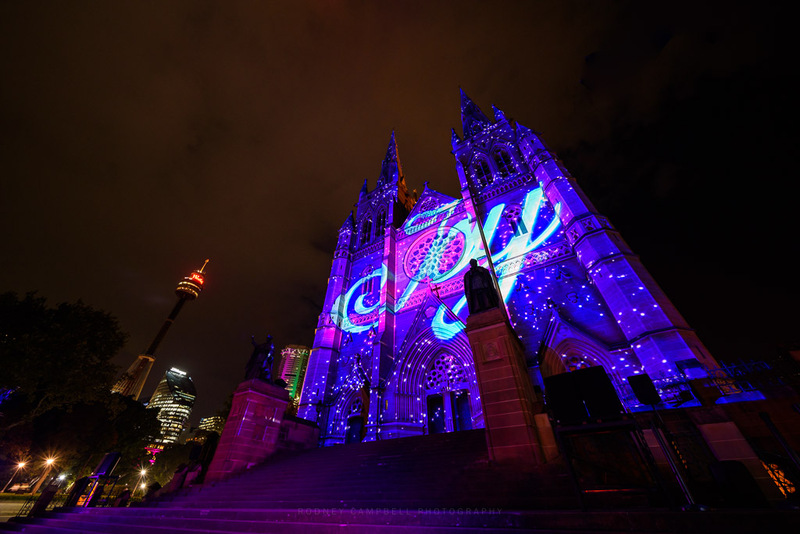 Hosted by the Catholic Archdiocese of Sydney at St Mary’s Cathedral the Lights of Christmas 2016 is a spectacular display of lights projected on the facade of the beautiful St Mary’s Cathedral. Each year they take one of the Christmas themes of Peace, Joy and Goodwill and develop an animated light show that entertains and inspires. 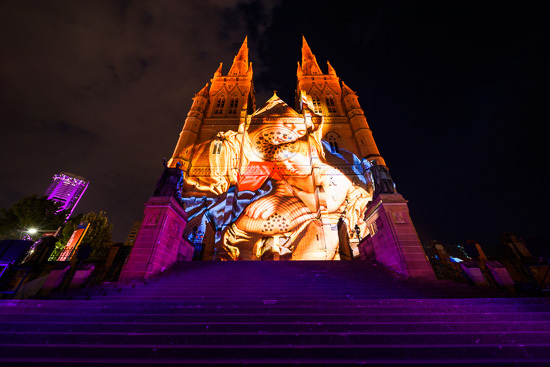 Running from the 8th to the 25th December 2016 – including Christmas Night. It starts each evening at 7:30pm with a choir performance – the light show commences at 8.30pm and continues through until midnight. Besides enjoying the fabulous display I was able to for the first time use a new lens I’d supported through a Kickstarter campaign. I’d actually received my Venus Optics Laowa 12mm f/2.8 Zero-D lens some weeks back but had yet to have the opportunity to use it. 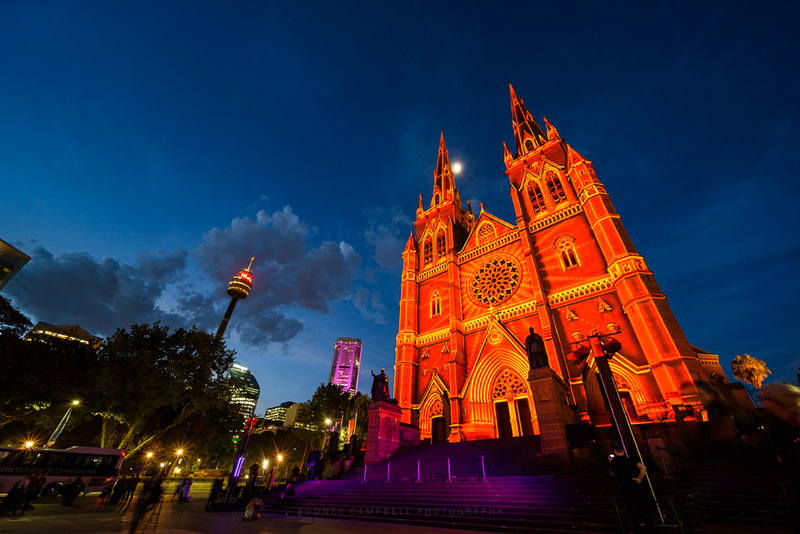 12mm is rediculously wide for a full frame lens with an angle of view of 122˚. Normally you’d expect an extreme level of distortion with such a wide lens. The images here are uncorrected from a lens distortion point of view. The image above show’s why this lens earns it’s Zero-D (Zero Distortion) moniker. Take a look at the steps at the bottom of the frame and notice just how horizontal, straight and undistorted those lines are – amazing. I wish I’d taken some shots with my Samyang 14mm for comparison. I’ll do a more complete writeup on the lens after I’ve had a chance to use it much more. For now however it’s looking very promising.